OK, one of our TOOSP group sent us Paul Potts, the Opera singing mobile phone salesperson. This next young lady, Connie we stole from my friend Gail's site Doing This For Myself. Well, as Travis says, you do not steal from friends....you borrow their ideas, and thank them for it. So, thank you Gail. Yesterday on ESPN's "Outside The Lines" show they had a Father's Day Story that we truly enjoyed. It is not a new story, in fact the story begins back in the late 1950's when Joe O'Donnell would play baseball with his son Pat and the neighborhood kids. Joe also played baseball for semi-pro teams in the upstate New York area. Dad and son talked about going to the Hall of Fame in Cooperstown one day but that day never happened when Joe passed in 1966 when Pat was 18 and about to have his first son. Pat did not have a close relationship with his son as he got divorced and his ex and son moved a few hours away. 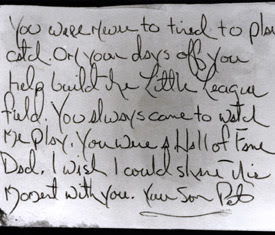 Pat did get to visit the Hall Of Fame in 1989 and while there he left the picture you see above with this note on the back. "You were never too tired to play catch. On your days off you helped build the Little League Field. You always came to watch me play. You were a Hall Of Fame Dad. I wish I could share this moment with you. Your son Pat"
He hid it between two cases honoring WWII and it stayed there until a renovation in 1994 when the photo floated to the floor as the displays were moved and a maintenance employee gave it to Mr. Ted Spencer, who is now vice president and chief curator for the Hall. Spencer was able to identify the uniform as one from the late 1930s or early 1940s, and the dinosaur logo helped tab Sinclair Oil as the man’s team. Realizing it wasn’t a Hall of Famer touched Spencer, who believed the story a perfect response to any baseball naysayers. An article authored by Steve Wulf was published in Sports Illustrated on April 4, 1994, before anyone knew anything about the picture. The article helped identify Pat O'Donnell. There is so much more to this story and it is not about baseball...it is about a love...and the outcome for Pat O'Donnell, the son who just wanted to do something special for his dad. Go HERE and watch the segment. It is a wonderful 10 minutes. You will not regret it. We saw this on the news on Saturday evening and then our good friend Dana sent us a link to the story on Sunday. ANTIOCH, Calif. - Kim Mayorga was confused when her 2-year-old started making funny faces and pushing away the apple juice he had ordered at Applebee's. The explanation came when she opened the lid of the sippy cup and was hit by the smell of tequila and Triple Sec. The restaurant staff accidentally gave Julian Mayorga a margarita Monday. He grew drowsy and started vomiting a few hours later and was rushed to the hospital. "I wasn't going to make a big deal about it," the mother told the Contra Costa Times on Thursday, "but then he got sick." The apple juice and margarita mix were stored in identical plastic bottles, and the manager mistakenly grabbed the margarita container to pour the boy's drink, said Randy Tei, vice president for Apple Bay East Inc., which owns the franchise restaurant and nine other Applebee's in the San Francisco Bay area. The Mayorgas will be reimbursed for their medical bills, and Tei said the franchise group's restaurants will no longer serve apple juice and margaritas in similar containers. "We absolutely believe it was an honest mistake," Tei said.The serving appeared to have been accidental, Antioch police Lt. Pat Welch said. Mayorga said her son is now doing fine.She said the company has been very apologetic and offered free meals, but she added, "If they think I'm going back there, they're ridiculous." OK KIDDIES, didn't mom notice the ring of salt around the edge of the sippy cup? Tiger Woods is walking to the practice green 2 behind in the U.S. Open on the TV before me. OK KIDDIES...time to raise you hand if you thought this was going to be a post about some enchanting date because of the title?? Come on...you, over in the corner...we see you hiding...you thought so...didn't you? You'll never believe what happened to me this weekend! I was meandering around Glasgow when I bumped into James McAvoy (friend from college but also the star of many a film - Mr Tumnus from Narnia for example). It just so happened that James was attending a premier of his film that night and was short of a date. Being the kind generous person that I am, of course I offered to help out! So James picked me up in his limo and drove me to the cinema... then past it and round the corner where he dropped me off with my ticket, before taking on the red carpet himself. First off, that sweet child gave me osepimples and made me cry. Now I have to fix the mascara... The pride on that mother's face. Beautiful! You're right, it's not about baseball. There are thousands of stories of parent and child bonding over a shared love for a sport (like you and Matt). I'll have to come back and watch the video. Glad you had a lovely leisurely lazy Sunday. You deserve it. SMOOCH! Great post. Great tunes, nice blanket.. I'm taking a nap now. I just adore Connie! I wish I could keep up with the show to see how she has done. Hoping she does well, if she hasn't already. As for my weekend, well majority of it was spent in the car driving back and forth into Downtown Chicago. Now if any of you know what the expressways are like to get into Downtown, it ain't no picnic! Throw 2 kids and 1 complaining husband into the mix and we got a woman on the edge! For a commute that should only take 45 minutes took 2 hours! Luckily there were no "Mom, I gotta go potty!" accidents, and we arrived at our destination okay. Downtown Chicago in the summer is the greatest! Everyone is out on the Mag Mile, shopping and having a good time...there is nothing quite like it! Well, except for Downtown Chicago at Christmas...but I'll tell you about that in December! 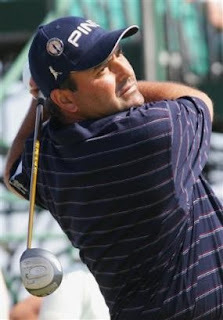 Cabrera wins the US Open on the anniversary of the end of The Falklands War...Ironic!! Cheers Vin..
hi bond, it was a good story. but honey, there was no cake in it?? what about that?? a good story has love, cake, a cruise ship, and chocolate. see? now then i would stay all day on the couch! OMG I saw that lil girl singing on You Tube, my kid showed me. Do you now if she actually one? Bond, I hope you had a fantastic Father's Day. I don't have the most entertaining weekend story for you...lol. I spent the whole weekend with Emi in the NICU which for me, was heaven, but for everyone else was very uninteresting...LOL! Lets get the easy stuff out of the way first. I did nothing this weekend, sue me, I am in a rut. I did see the Outside the Lines story on Sunday and it was great. It didnt get me all choked up, but it was great. No singing kids, I am still loving last years AGT USA Winner, Bianca something. I thought that little girl was terrific. Great Outside the Lines feature. The problem wasn't the salt, it's that the kid actually ordered his margarita on the rocks no salt and they brought him a frozen with extra salt. I bought curtains...not really all that exciting, but it's unique! Wait...you mean you didn't have a date? The singing kid was great. Puts me to shame. As far as I'm concerned, the ONLY way to drink margaritas is rocks/no salt, unless you're at home and making them yourself. Then, anything goes! Such a beautiful kid! Wow, can you imagine what she'll sound like when she gets older? Gee thanks Vinny, now you've got me balling like a baby. I couldn't get past Connie. TRAVIS: LOL..curtains..humm we will give it consideration...LOL ---what voices? DIXIE: LOL and the story was even more emotional I know what??? Heard it was your birthday...hope you had a good one! I heard the child sing Somewhere Over the Rainbow. It is totally angelic. Yup...that little girl was very interesting...I'd like to hear her in another 10 years! "...salt around the edge of the sippy cup." Bwahahahahahahha Oh my! I don't usually watch golf..but that tournament was slightly interesting. Well my weekend was so busy dear Vinny that I didn't even get here!